Are you looking for in-home care in South East Queensland? Are you living with a condition or disability with complex care needs? Beacon home care can help you manage the impacts of your condition but also assist you with everyday tasks that may be hard for you to manage alone. Our Beacon Home Care is delivered by experienced, skilled and qualified carers who will have your individual needs top of mind. The Australian government provides support for the aged and those living with a disability to remain in their homes for as long as possible. People over the age of 65, and in some instances over the age of 50, could qualify for a government subsidy for aged care home support. Beacon Home Care can offer you care and support at every level. You design your home care package with assistance from our team and based on your individual needs. You take charge and you make the decisions on what services you want and when you want them. We are guided by you through every step of the process. Depending on your situation you may be eligible for National Disability Insurance Scheme (NDIS) or other funding. We are more than happy to answer any questions you may have about funding you may be able to access. You also have the option to fund any care from Beacon Support yourself. If you believe that it is time to apply for aged care funding support you should contact the Aged Care Assessment Team (ACAT). They will consult with you to determine for which level of care you qualify. Once you are approved ACAT will transfer the subsidy into your account. 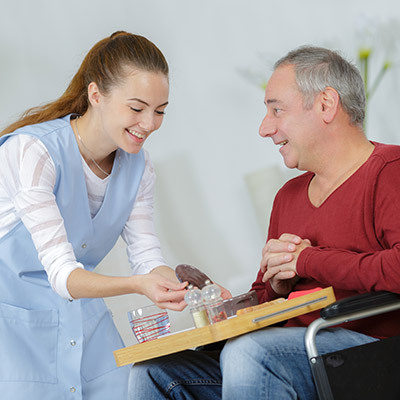 Then you can choose your a package that suits your personal home care needs and your budget. You may be required to make a co-payment depending on your financial circumstances. You can also pay for additional services if you require them. At Beacon Home Care we remain focused on providing highly skilled care and support you can trust. Our team is committed to ensuring you feel safe and supported at all times. Regardless of your situation we know what to do and will deliver your care professionally and with empathy. Your in-home care and support will be provided under the supervision of a Registered Nurse to ensure you receive quality care. We are also a registered NDIS provider. Call us today at 1300 435 782 or contact us via our online form for a consultation to find out more about our Beacon Home Care services.